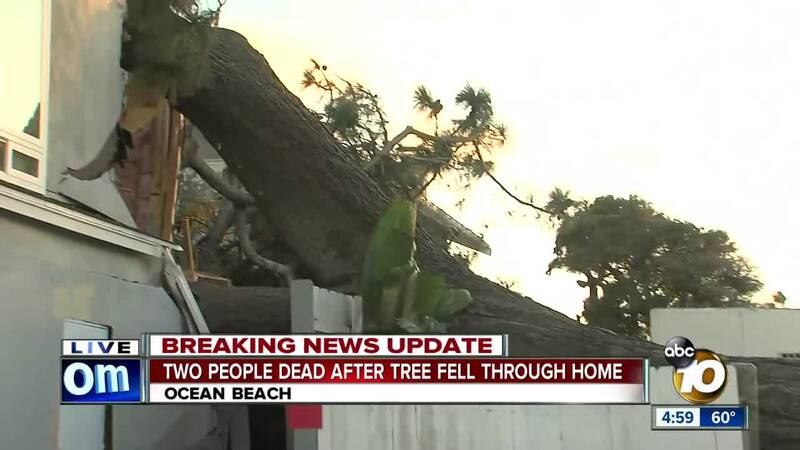 Two people died after a tree fell onto a home in Ocean Beach. 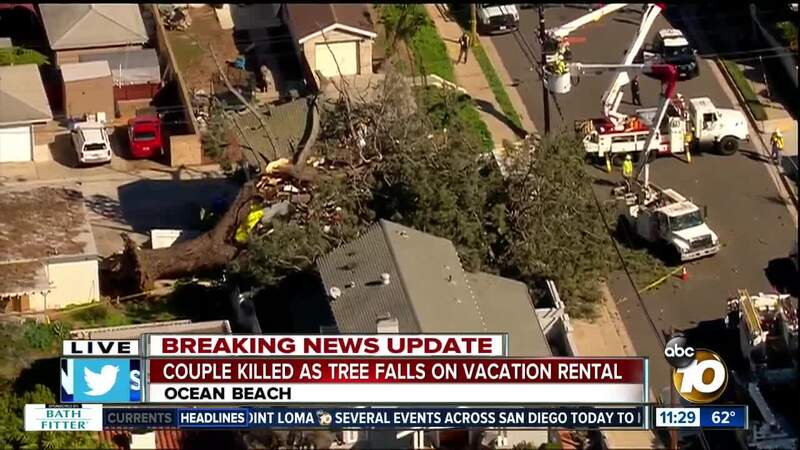 SAN DIEGO (KGTV) - A married couple from North Dakota was killed Monday morning after a large tree fell on top of a house in the Point Loma Heights area. The couple was identified as Jessica and Troy Nelson of Fargo, according to Troy's sister Tammy Reynolds. They arrived in San Diego Saturday for a trade show and were due to leave today. The incident was reported shortly before 6:15 a.m. in the 4400 block of Santa Monica Avenue. Authorities at the scene told 10News a man and woman were sleeping upstairs in a vacation rental unit when the massive Torrey Pine tree, which sits on a property next door, came down on the house. "I was devastated. I feel so bad, horrified if it was so unnecessary," said neighbor Peggy Harris. A male relative of the couple who was downstairs at the time of the incident was not injured. Investigators are trying to determine what caused the tree to fall down. An arborist told 10News the tree is about 75 years old and stood 100 feet high. Experts believe the tree fell due to a combination of wind, saturated ground, and a lack of soil surface for a tree of its size. Torrey Pine trees are generally found in big parks where roots have room to grow, experts said.